Surgeons say they have had success with a controversial transplant technique that uses risky donor kidneys containing cancerous masses. So far five patients have been treated by the team at Baltimore's University of Maryland School of Medicine. 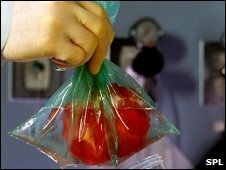 The US surgeons say the technique offers a vital lifeline to patients with end-stage renal failure who could die waiting for a healthy donor organ. None of the patients has yet developed cancer urology journal BJUI reports. Before the transplants took place, the doctors said they had detailed discussions with the patients and the donors about the discovery of the cancer in the donor kidneys so that they were both aware of the risks, including recurrence of the cancer. Urologist and head of the surgical team, Dr Michael Phelan, said: "Transplanting a living donor kidney which has been affected by a renal mass is controversial and considered high risk. "However, the ongoing shortage of organs from deceased donors, and the high risk of dying while waiting for a transplant, prompted five donors and recipients to push ahead with surgery after the small masses were found in the donor kidneys." The kidneys were removed from the donors, put on ice and taken to the operating rooms for preparation for transplantation. The surgeons then removed all visible traces of the tumours - five masses ranging from 1cm to 2.3cm in size, three being malignant and two benign - before transplanting them in to the recipients. One of the recipients has since died, from an unrelated accident. But the remaining four are well between nine and 41 months on. Dr Phelan told the Journal of the British Association of Urological Surgeons this was proof that 'risky' kidneys could be a viable option for some. He said: "The current study provides evidence to suggest that kidneys from donors with renal masses offer a minor, yet feasible, solution to the current organ shortage. "These organs can be transplanted into recipients with limited life-expectancy on haemodialysis after careful removal of the renal masses. "However, diligent follow-up of the donor and recipient is imperative in these cases." Keith Rigg, medical advisor for the charity Kidney Research UK, said: "New initiatives to increase the number of life changing transplants are welcomed. "The results of removing small tumours from kidneys prior to transplantation are encouraging from this small study. "It is important though that the potential risks and benefits are fully discussed with the donor and recipient, and that the recipient of the kidney is subject to long term close scrutiny, to ensure that any risks in the long term are minimized."